High Speed Gear Sure Grip Padded Belt Slotted FREE SHIPPING! Carry all the gear needed for a day in the field securely on the waist using the Sure Grip Padded Belt from High Speed Gear. Designed to offer all day comfort, the belt features the durability and versatility needed to securely hold the weight of a fully-loaded battle belt. A unique, slotted MOLLE platform allows the user to weave the inner belt inside and outside the MOLLE panels to create a custom combination of belt and web attachment points. 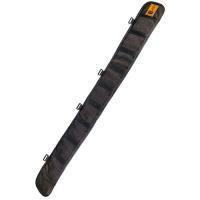 Once configured, a SureGrip backing grips the waist, providing a superior hold and a stable fit. Thick neoprene padding forms to the contours of the body, creating a comfortable fit that will not bruise or chafe skin. Four strategically placed suspender attachments offer further support and stability if needed. A removable HPDE stiffener increases rigidity to prevent sagging. ©2002-2019 CopsPlus.com: High Speed Gear Sure Grip Padded Belt Slotted FREE SHIPPING!